Board index Smartphones-A gadget of all time..
Blackberry has unveiled its premium flagship Z30 phone in India, pricing it at Rs 39,990, this device has been launched to take on the competition with other smartphone makers like Samsung & iPhone. 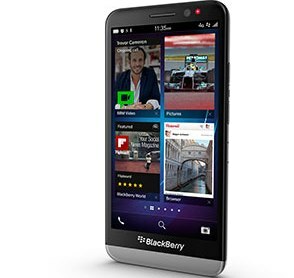 BlackBerry Z30 which features a 5-inch display with 720 x 1280 pixels resolution runs on Blackberry 10 OS version 10.2. It is powered by 1.7 gigahertz Snapdragon S4 Pro processor and has a 2880 mAh capacity removable battery.It has an 8 megapixel rear camera and 2 MP front camera and comes with a 2880 mAh capacity removable battery. It has 2 GB of RAM and an internal memory of 16 GB that can be expanded to 64 GB with microSD card. The company has launched this device with an eye on the festive season demand rush, BlackBerry said Z30 -- which was originally priced at Rs 44,990 -- will be available in retail stores across the country early next week. The other feature of this device includes stereo speakers, BlackBerry Natural Sound among others. This is biggest phone from the BlackBerry stable so far.